Your body has its own built in immune system to protect you from outside elements such as dust, pollen, pollution, etc. If your immune system is not working properly you may suffer from watery eyes, a running nose, sneezing, or many other signs of potential bodily insult. 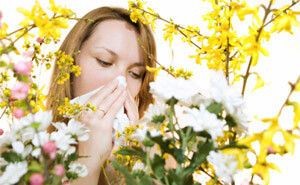 Histamines cause most sinus and allergy problems. Most people treat these problems with anti-histamines. These medications will dry the membranes and suppress the symptoms but are not a cure. Stress can often play a large role when your immune system is not working properly. When ignored your body loses it's innate ability to correct itself. The nervous system and immune system, when working properly, can work as a natural healing aid and help to correct your sinus and allergy symptoms. Feeling tired, drained, exhausted, and depressed, these are symptoms commonly known as fatigue. You wake every morning feeling like you were up all night, well maybe you were. Most people that have mood swings do not even realize how unpredictable their moods can fluctuate. When pain occurs it is showing you that somewhere in your body a problem has surfaced. After years of pain, Dr. Berry and his staff gave me a new lease on life. When I leave their office after a treatment I have so much energy and are virtually pain free. Thanks for changing my pain to painfree. Receive a Free Spinal Examination Today.